I’m not a big fan of salads or raw vegetables. I think it partly has to do with growing up in a Chinese-American family, where all vegetables were stir-fried, steamed, or cooked in some other way. 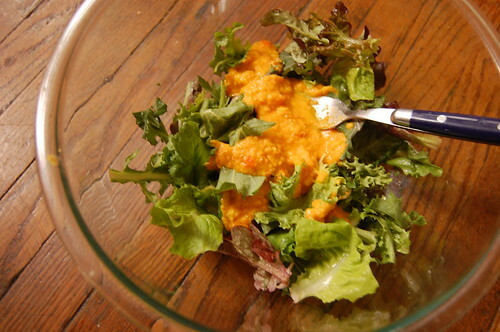 However, I’ve always been a sucker for the ubiquitous carrot-miso-ginger dressing you see at Japanese restaurants, where they toss some grated carrots, cucumbers, cherry tomatoes, and romaine together and present it as a throwaway appetizer with the miso soup before your bento box. Last week, the Ithaca Farmers’ Market opened for the spring season, and aside from the usual baked goods (chocolate brioche oh mah gah), the produce was still pretty sad looking – just some leeks, spinach, greens, and root vegetables here and there. But I remembered the salad dressing from Goop and Smitten Kitchen and I knew that I already had the other Asian ingredients in my pantry, so I figured I’d grab some shallots and carrots, break out the blender, and give this a whirl. It comes surprisingly close to those restaurant dressings. I threw in a pinch of sugar to balance the bite of ginger and tossed it with some organic mixed greens that I also picked up at the market. And even though I paired this with yet another grilled Brie sandwich, the salad still made it one of the most virtuous meals I’ve had in a while. Blend the carrots, shallot, and ginger until finely chopped. Then add the miso, vinegar, sesame oil, and sugar (if using). While blending, add the neutral oil and water until you reach the desired consistency (I tend to like a smoother consistency for this particular dressing). Serve and toss with your favorite greens and vegetables. You are currently reading Turning a new leaf at Notes on Food.